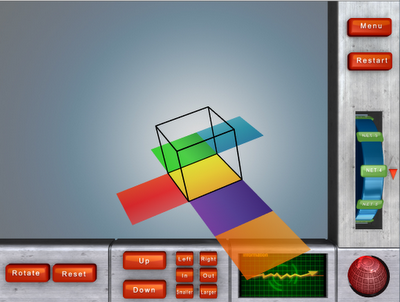 Our last entry into a future hall of fame for educational 3D content is 3DStereoLab. This is a group that demonstrates the most impressive creativity, artistry, and negative parallax I have seen in 3D production to date, bar none. I am talking about absolutely compelling production quality. This firm got its start by pulling together some of the best talent in L.A. and Hollywood, securing a new studio, and pushing the production flywheel forward. Much of their work is for corporate innovation centers, and most recently they have undertaken a large project involving school safety PSAs and simulations for school emergency preparedness training in 3D format. 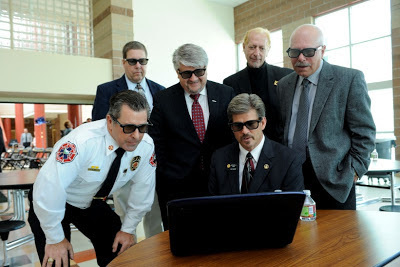 by Governor John Hickenlooper at Rock Canyon High School in Highlands Ranch, Colo.
Another entry in our sweepstakes for the future of great educational 3D content is a stout and familiar player, Sweden’s Eon Reality. Eon Reality offers a crowdsourced vision of cloud- and social media-based 3D educational content development and distribution: Eon Creator and the Eon Experience. Both are well integrated and offer a distinct social-media look, with easy user search, access, or upstream contribution, as well as user-generated content ratings. to download commercial or user-generated 3D content or publish their own content. 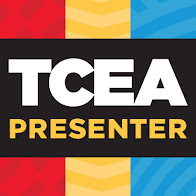 Now this is the point where I am forced to chime in: “You betcha!” Eon Creator was designed for non-professional content producers (a.k.a., students and teachers). The advantages are obvious. The Eon Experience platform creates a friendly space where the 3D educator can become a consumer, producer, or both. More importantly, both tools were evidently created with the school educator or industry “human performance improvement” professional in mind. on one the icons layered in a pyramid above the 3D object. For example, 3D objects can be placed within a 3D gallery or exhibit hall scene for casual or in-depth exploration. 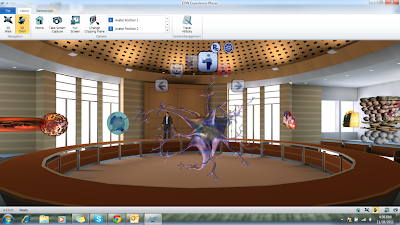 A trainer can also insert or embed learning resources into the 3D objects he/she has designed. This enables the creation of richly layered, hypermedia-based learning experiences that can stand on their own. The trainer/instructional designer can associate many different types of “learning objects” with the 3D model or object, including short video segments; personalized text or audio annotation; a PowerPoint presentation; a wiki, blog, or discussion board; or a hyperlink to a website or simulation activity. 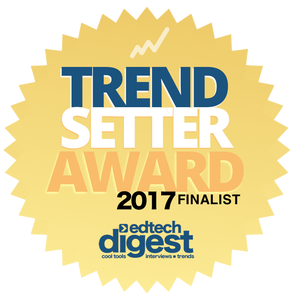 Folks, this is designed for great teaching, learning, and instructional design! I teach some very popular workshops on how to do teaching (or sales presentations) differently, based on how our minds work. Based on brain research, the techniques I employ cleverly draw the attention of the audience, while sustaining their focused attention on the learning at hand. Done well, these techniques can even go so far as to visually ‘delight’ the viewer. It’s all part of my personal campaign—my intentional effort—to utterly destroy the old notion of “death by PowerPoint,” the notion of tiresome, unimaginative, overly lengthy, and utterly boring PowerPoint presentations. Of course, the notion of “death by PowerPoint” is forever immortalized in such Dilbert cartoons as the PowerPoint Coma, the PowerPoint Chimp, and PowerPoint Poisoning. In the stereoscopic 3D world, many have tried to provide a way to convert traditional presentations into stereo 3D, hoping to capture the illusive golden goose ‘wow’ factor. 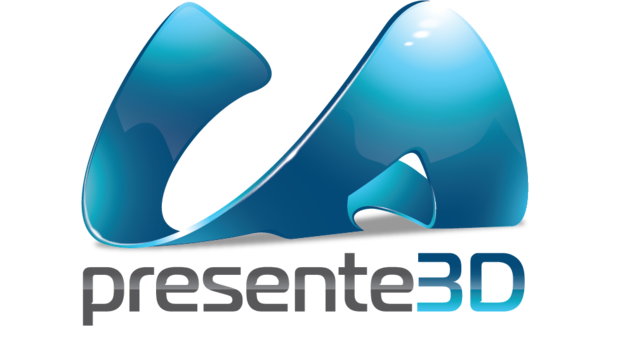 Our third entry in the field of Next Generation Educational 3D content is Presente3D. This new startup aims to become nothing less than a game-changer for educators. What these folks are up to is so promising, I playfully call it Depth by PowerPoint, and I assure you it is a good thing, and for quite a number of very practical reasons. 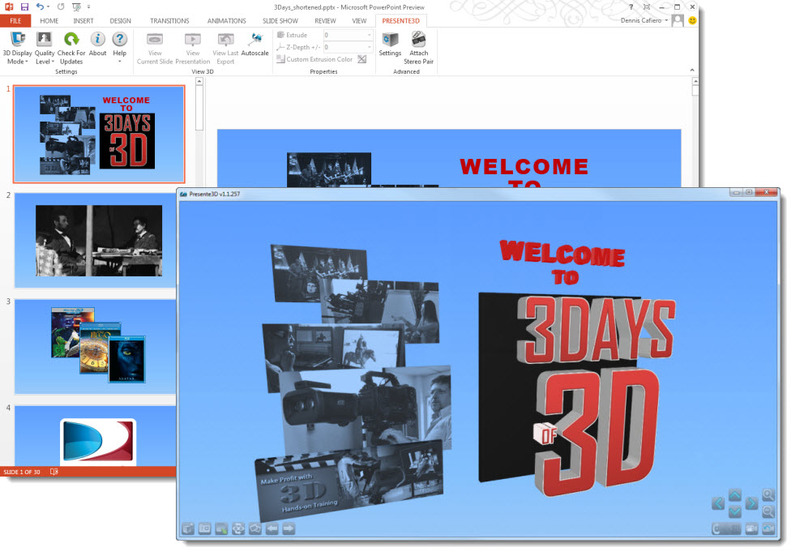 First, Presente3D enables 3D content creation through a truly easy-to-use and extremely flexible ribbon bar add-on to PowerPoint 2010. " It enables the educator, e-trainer, or student to turn their presentations into a 3D format, but more importantly, to turn any graphic or chart within a PowerPoint into a 3D object that can be manipulated in space and depth. Any object or text can be individually extruded and the z-depth adjusted, as well. Presente3D, with offices in New Jersey and a talented technical team in the Ukraine, offers the potential for some very creative and immersive presentations. Their easy and flexible process for designing 3D presentations also offers a stiff advantage: it’s easy enough to use that you can construct effective stereo 3D PowerPoint presentations the night before your presentation. Here an overview video and here is a video showing how their interface works. In addition, this tool is quite extensible. It runs on most portable devices, including Apple and Android operating systems, the iPad2, and all 3D TVs and projectors. Yet, the significance of this effective new 3D tool lies with content creation. 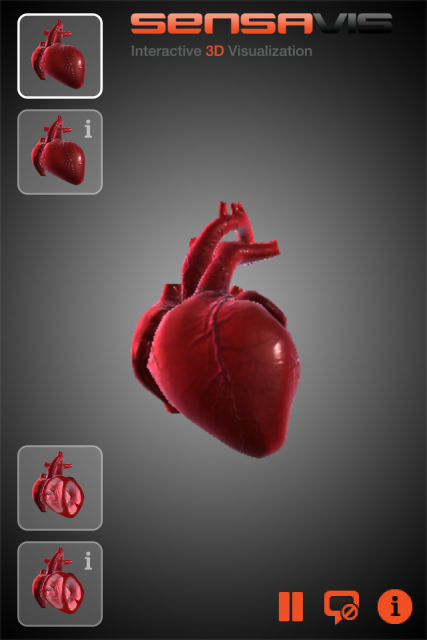 Perhaps 95% of educational 3D content currently available supports science instruction. Math content is well on its way toward a solid presence this year. 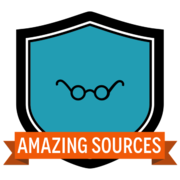 But this tool opens up the floodgates of immediate amateur content creation for all the other subject areas, such as English, world languages, social studies, and the arts—to name a few. Think about it. There are over 500 million PowerPoint users worldwide. Currently, over 50 million PowerPoint presentations are made every day. Now, anyone can be able to create 3D content. It is simply content creation for the rest of us. Our second featured nextgen company is Spatial Thinking, a California-based company with a talented international programming team located in both L.A. and Lebanon. Spatial Thinking is led by its founder, George Dekermenjian, who is a gifted master teacher and active college mathematics professor in his own right. Formed to exclusively serve the education space, Spatial Thinking builds interactive simulations that can be presented in stereoscopic 3D as tools for teaching and learning math for grades 4-12 and college math. 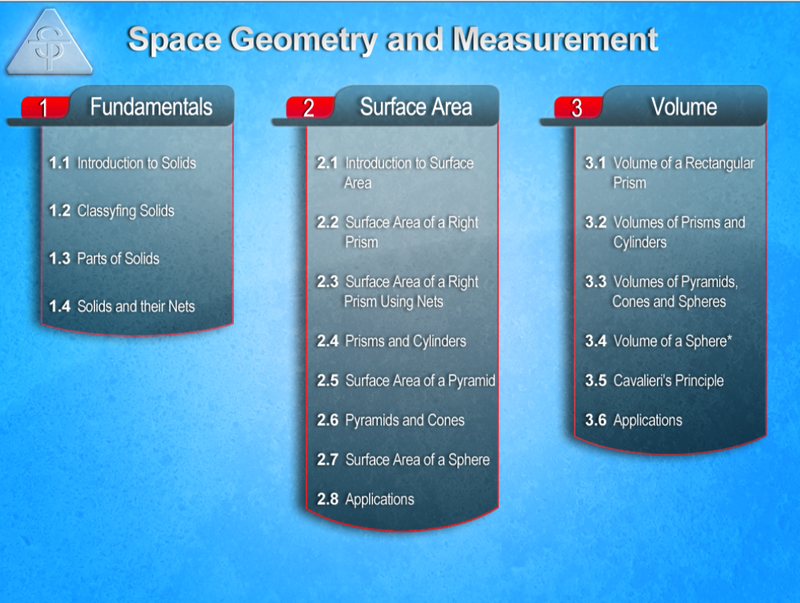 Their flagship product is Space Geometry and Measurement 3D (SGM-3D and SGM-S3D). Both versions contain the same content, but the latter (SGM-S3D) is optimized to be viewed in stereoscopic mode while the former is produced in rendered 3D. This approach exemplifies a generally wise strategy for success in the stereo 3D marketplace: offering 2D content as well as 3D content. When schools are ready, the shift to 3D is easy and costs less. Using 3D to teach concepts that are harder to learn without stereo 3D. 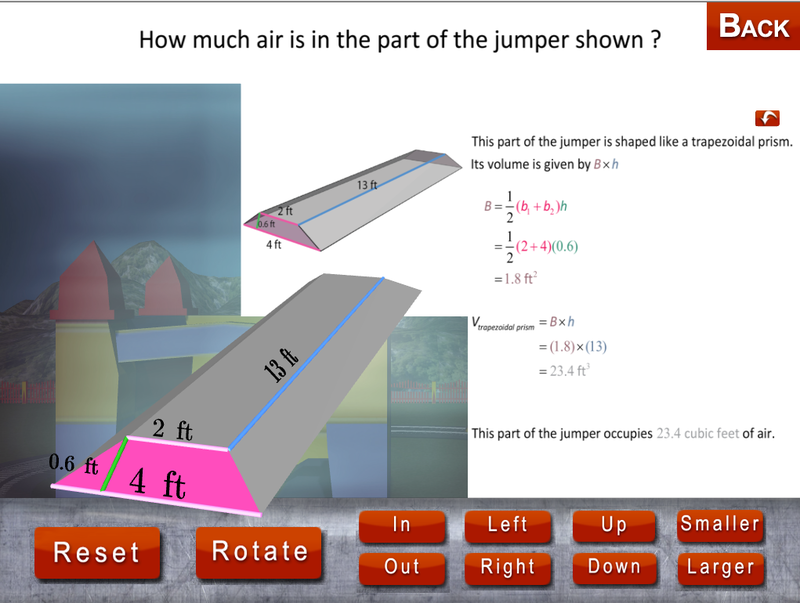 This company starts with the premise of the added value stereo 3D can bring to learning; I like that. Spatial Thinking produces simulations that use stereo 3D to an advantage, concepts that lend themselves naturally to 3D visualization. Essentially, that means using 3D to teach concepts that are difficult to learn without 3D. Spatial Thinking understands the educator perspective as much as they understand the technology of 3D visualization. This company demonstrates an openness to learn and do what schools, teachers, and students want and need, not just pursue the technology for its own sake. Their content represents a significant move beyond the current hegemony of science content in the 3D educational marketplace—and math is a great place to start. They surround their software with exactly the kinds of supporting materials that teachers are dying for: visual PowerPoint supports, lesson guides, and extension materials. 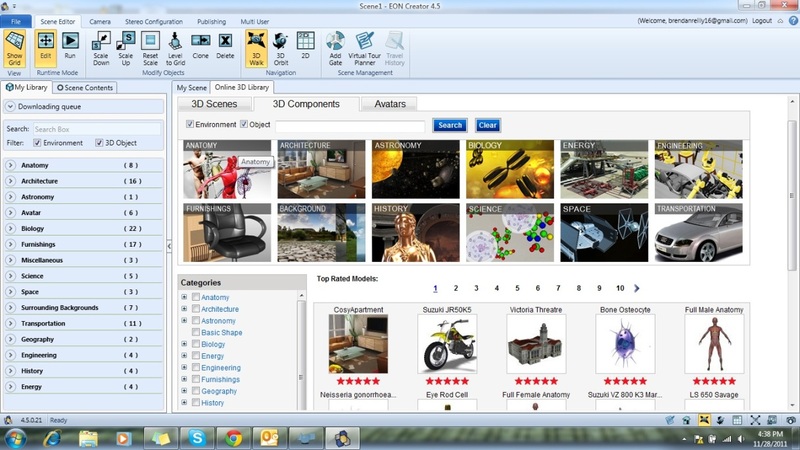 Stereo 3D educational software designed the way teachers like to teach. Spatial Thinking’s plans to build additional interactive stereo content for other areas of mathematics, such as analytic geometry, calculus (high-school and college level), and other higher mathematics courses typically offered at the college level or beyond. Spatial Thinking’s web site can be found at: www.spatialthinkingllc.com. action manipulation. And their content runs on iPads. Our first featured nextgen company is a remarkably skilled group out of Sweden, Sensavis. 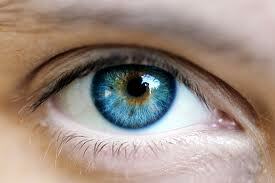 They offer products in the field of corporate and medical education, marketing, and visualization. I've explored their products and works-in-progress first hand and found myself nothing less than stunned. 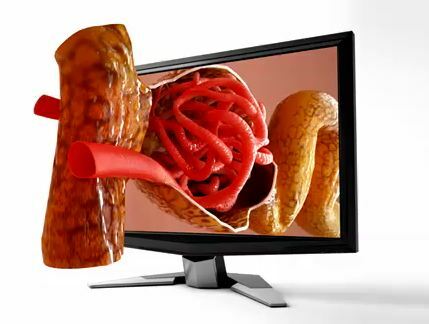 I have seen it all with regards to 3D educational products on the market, and this is the best imagery I have seen. 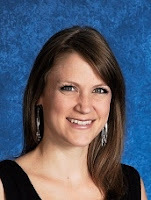 More importantly, it works the way teachers and professors really want 3D learning to work, based on the end-of-project teacher interviews conducted following our year-and-a half case study in the Boulder Valley School District. In a past blog post about educational content, “What is eS3D,” I describe five of the key attributes of outstanding 3D educational content, and the Sensavis masters all five. Sensavis has produced an Interactive 3D Human Framework (I3HF), which approaches discovering the human body from a physiological perspective – meaning that you see fluids flowing and particle systems moving, not just 3D learning objects. Their presentations are so completely interactive, you can zoom endlessly from macro to micro, steer around, or choose from a navigation client to add slides or film into the model. If only they would create content for the high school market! content is also produced in stereo 3D. Sensavis’ remarkable vision, driven by CEO Magnus Arfors and a world-class development team, is grounded in several fundamental beliefs. First, Arfors suggests that “Humans were equipped to learn through experience. The closer we can get to an experience of a message, the closer we get to an understanding of that message (and in shorter time).” Interactivity is key to his notion of experience. Arfors explains: “Film is linear, yet interactive content is non-linear. You choose where you want to go.” Arfors offers a simple formula for 3D success: “3D + interaction = understanding and recollection.” He reminds us: “Regardless whether the interactive 3D content is for general education, learning science, or used in marketing—it enhances understanding and stimulates the learning process in a way that the audience is engaged and remembers the experience and the messages.” Arfors’ theories translate well into practice. Two weeks ago, a professor used the Sensavis’ 3D In Vitro Fertilization (IVF) visualization in her lecture for 100 medical students at the Karolinska University Hospital. Arfors gleams: “This was their première for interactive 3D content and already the enthusiasm is spreading internally at the university. Third, Sensavis’ accomplishments are grounded in solid technological advantage. They have developed their own visualization engine. They have reliable hardware delivery platforms, including an auto-stereoscopic streaming solution that can be used for companies desiring to distribute education content to local sites, universities, or hospitals from a central server. And they are agile enough to take on special projects in the fields of science or education. (For example, Sensavis just completed a production focused on In Vitro Fertilization (IVF), visualizing the achievements behind the Nobel Prize in Physiology or Medicine (2010). I have often stated that my personal vision is to make the world of teaching and learning a better place, to enable the kind of teaching that fully engages and challenges our 21st century learners. I believe Sensavis’ creativity clearly moves us in that direction. Sensavis can be reached at www.sensavis.com. The current generation of educationally focused content available in stereo 3D is very usable in schools. It is often quite impressive from the perspective of teachers and students. (See my comprehensive list of all currently available educational stereo 3D content here.) The future, however, promises to be even better. Behind closed doors, content developers are working feverishly on the next generation of stereo 3D educational content. And I’m not talking about movies here. I am referring to software specifically designed to bring together as many of these characteristics as possible: tremendous artistry, solid curricular and educational fit, and practical and easy software delivery—all while aiming to leverage the real strengths of the stereo 3D medium in the classroom. 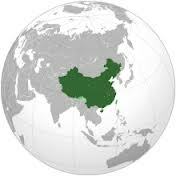 Interestingly, these efforts are happening across the globe, not solely in the U.S. Over the last six months I have quietly reviewed the visions and products of a number of different companies. I’ve sat down with each of them, all the while thinking deeply about what’s happening with the coming generation of 3D educational content. The companies I plan to highlight in the coming series of posts are not the only firms that are working on nextgen stereo 3D for the educational market, but these companies offer a mouthwatering hint of what is now emerging. At the very least, this series presents a rare opportunity to delve into the minds and motives of some of the most inventive and promising 3D educational software developers in the world. As discussed in the previous post, 3D is really taking off in Asian and other emerging markets. 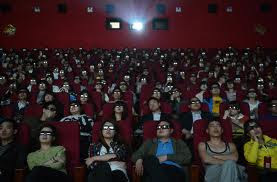 Since many of our regular blog readers come from these emerging markets, I thought a thoughtful reminder, presented via a simple mystery, might be beneficial: Can you see anything peculiar in this snapshot of the first showing of Titanic 3D in Shanxi, China? Click on it to enlarge it. Again, and this time internationally speaking, our educational challenges remain constant. We know from the research that 3D is not harmful in any way. But some people do experience discomfort, which actually is an indication of underlying vision problems, not necessarily a problem with the 3D. For a complete resource on understanding the role of 3D in vision health and vision screening, see this well-travelled Future-Talk 3D post. San D is how you say 3D in Mandarin Chinese. You see, that’s important to know these days. It’s because most of the interest in 3D entertainment and 3D TVs these days appears to be in China, followed by Western Europe and key emerging markets (Russia, Latin and South America, and the Middle East). Although TV sales across the world are generally in decline, some sources suggest upwards of 10-20 million 3D TVs will be sold in China this next year. I remember how high the interest was in 3D when I first spoke in Beijing at their first ever 3D Innovation Forum. I continually get that same sense. Even in the education market. But I think the 'resistance' reasons are vastly different for the U.S. education marketplace. Educational 3D is not about 3D TV at all. In education, I think any perceived resistance is due to the tough recession facing schools (hopefully short-lived) and generational issues. By generational issues, I mean to say “kids want it.” Adults—not so much. Kids don’t mind the glasses—adults don’t know any better. For more background on this topic, please revisit my original post on this topic: On Youthful Shoulders. In the meantime, I still see innovators and pioneers in education showing keen interest in 3D. Don’t give up! 3D printing companies started to make a splash at various conferences this past summer. 3D printing is just another way for students working with rendered or stereo 3D design to bring their creations into the physical world. These systems are expensive, but their increased presence at conferences speaks to an interesting growth phenomenon. A most refreshing customer experience during my gold panning efforts this summer occurred at InfoComm at the Korean Pavilion. In a 3D-dedicated area, they featured some of the finest 3D educational content (cultural and historical documentaries) I have ever seen. They were good. Very good. Visually compelling, not 3D dribble. I am not sure they know how good this content really is. I want to locate some of this content. Remember, 3D as a medium can only be explained, sold, or advanced well if we have great content in hand. I know we have many readers from Korea who frequent this blog. Can you help us identify this content? Can our Korean readers help reveal this content to the world? Okay, this is not 3D. I know that. That’s why I said there was a speck of silver in my gold pan. (Yes, it is quite possible to pan for silver.) This software is so promising, that I must tell educators about it. 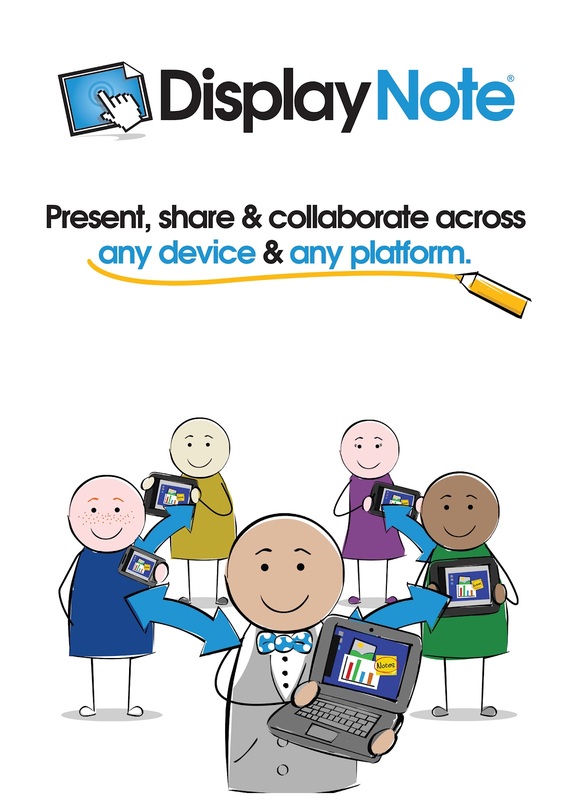 DisplayNote is an Irish startup with a product designed to share, annotate, and communicate student displays across platforms and across devices. I can share my laptop screen to each device, share a device’s screen to my classroom projector so all students can see, see what students are working on when using their own devices, annotate non-destructively on top of my screen or theirs, and so on. At various conferences, I saw large-district CIOs, major thought and opinion leaders, and journalists quietly interviewing the DisplayNote staff in one-off discussions. I haven’t seen so many power players quietly drawn to one booth in a very, very long time. Here is a video explanation of their product. 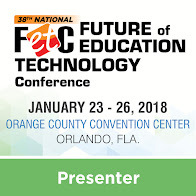 The flexibility and potential of this product in the classroom—given its ability to support multiple platforms, multiple devices (think iPads and tablets), and even enhance the role of the traditional classroom projector and preferred pedagogical styles of teachers at the primary, secondary or higher education level—is noteworthy. A fleck of silver.